Connecting the past with the present in a sustainable manner is the basic principle of the Heritage and Spatial Planning Programme (2017–2018). This initiative is a means for Creative Industries Fund NL to connect design with cultural heritage. The goal is to involve designers with topical social issues – e.g. climate change, energy transition and ageing populations – which have a direct effect on the spatial organization of the Dutch cultural landscape and our everyday living environment. The programme spans a two-year period and is being set up and implemented in close collaboration with the Cultural Heritage Agency of the Netherlands (Rijksdienst voor het Cultureel Erfgoed or RCE). For the Dutch heritage sector, which until recently was chiefly focused on the conservation of properties and landscapes, a regionally focused approach to heritage in combination with current design tasks and spatial developments is something new. Building upon existing identities in the design process gives rise to a high-quality and more differentiated living environment. The intention with this line of approach is that from 2019 existing cultural-historical qualities will constitute a more naturally integrated component of new environmental visions and spatial planning developments. The programme consists of three main themes. The Fund will be phasing four Open Calls within the programme's 'Energy transition in the landscape' and 'Climate adaptation in the city' tracks over the course of 2017. 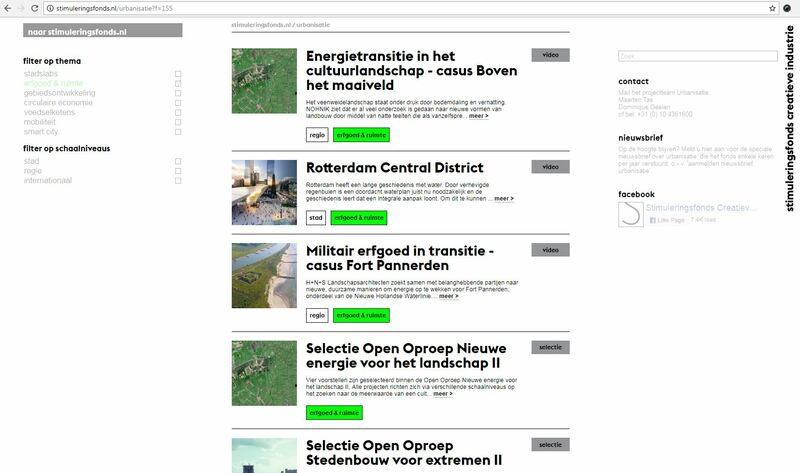 Two Open Calls which are open now are: Stedenbouw voor extremen en Nieuwe energie voor het landschap (in Dutch only). The third programme track ─ a pathway to knowledge focusing on care in post-war districts and areas with shrinking populations or otherwise in decline ─ will be launched in late 2017. The programme spans a two-year period and is being set up and implemented in close collaboration with the Cultural Heritage Agency of the Netherlands (Rijksdienst voor het Cultureel Erfgoed or RCE). The Open Calls and a pathway to knowledge are a means of putting specific issues on the agenda and bringing in multidisciplinary teams of architects, urban planners, landscape architects, cultural historians and commissioning parties in order to conduct research into a topical assignment. The Fund guides the teams, initiates collaborations, organizes meetings for the sharing of expertise and experience, as well as the presentation of results. website (in Dutch only): The Fund will be sharing the knowledge, research and experiences gained within the supported projects on the Urbanisatie (Urbanization) website. At the request of the Directorate of Heritage and Arts within the Ministry of Education, Culture and Science (OCW), Creative Industries Fund NL has developed the two-year Heritage and Spatial Planning Programme 2017–2018 in association with the Ministry of Infrastructure and the Environment (IenM) and the Cultural Heritage Agency (Rijksdienst voor het Cultureel Erfgoed or RCE). The programme is part of the Vision for Heritage and Spatial Planning (Visie Erfgoed en Ruimte or VER), which will in turn serve as input for the future National Environmental Vision (Nationale Omgevingsvisie or NOVI), which addresses the long-term organization of the Netherlands. The NOVI is currently being devised by national government and provides the framework for the new Environmental Act that is set to come into effect in 2019: National, provincial and municipal governments will from that point be obliged to formulate an environmental vision for their respective territories. The results of the Heritage and Spatial Planning Programme will be providing input for the NOVI as well as environmental visions of lower tiers of government.